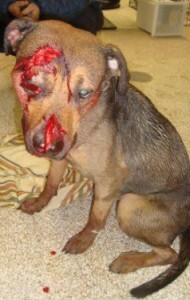 A dog attacked yesterday by a neighbor wielding a machete is scheduled to undergo surgery tomorrow. On Tuesday evening, a man walked into his neighbor’s yard and attacked the dog in the face and head with the machete, inflicting injuries that went all the way down to the bone, authorities said. The dog, named Okashia, lives on the 3000 block of Wylie Avenue in northwest Baltimore. While she lost a lot of blood, the dog is expected to recover, though vets were worried she might lose an eye. Okashia, a shepherd-pit mix, was taken to the Emergency Veterinary Center in Catonsville, where she was sedated and given intravenous fluids. She was returned to Baltimore Animal Rescue & Care Shelter (BARCS), where she was expected to be evaluated by a surgeon this morning. As a result of Okashia’s treatment, and other recent emergency cases, BARCS’ Franky Fund — reserved for the most serious cases of sick and injured animals — is seriously depleted, according to officials at the shelter. Contributions may be made here. Caroline A. Griffin, head of Baltimore’s Anti-Animal Cruelty Task Force, said that in addition to injuries to her head, the dog has been found to have bruising to her lungs. Because of that, the decision was made to postpone surgery for her facial injuries until tomorrow. According to police, Levar J. Bailey, who lives several doors down from the dog’s owner, attacked the dog in her own yard. When police arrested Bailey, 33, he was yelling, “The dog was trying to bite my daughter,” according to charging documents. The Baltimore Sun reported that Bailey was taken to an area hospital for a psychiatric evaluation and that, according to police, he has a history of mental illness. The two-year-old dog is owned by Shea-Quan Moore-Williams, who went outside after hearing the dog yelping to find her bloody dog and Bailey in the yard with an 18- to 24-inch black machete.